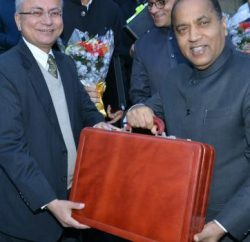 Shimla: The Himachal Pradesh Chief Minister Jai Ram Thakur presented a budget of Rs. 44, 387.73 crore in the Vidhan Sabha today. The Chief Minister proposed budget of Rs. 44,387.73 crore in 2019-20, which is an increase of 7% against the 2018-19 budget. The revenue receipts of 2019-20 are estimated at Rs.33,747 crore, Revenue expenditure is likely to be Rs.36,089 crore and the revenue deficit will be Rs.2,342 crore. The fiscal deficit is estimated at Rs.7,352 crore in 2019-20 which is 4.3% of GSDP. The net borrowing will be Rs.5,069 crore which is within the borrowing limit as per the FRBM Act. 1) State Government has decided that 10 percent reservation will be provided to Economically Weaker Sections of general category in employment and educational institutions. 2) The social security pension proposed to be increased from the present Rs.750 to Rs.850 and Rs.1300 to Rs.1,500. 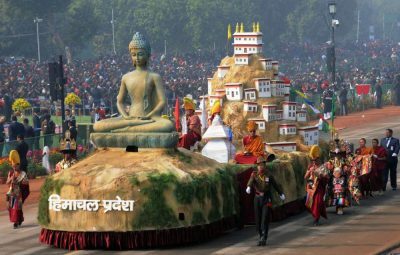 More than 5 lakh persons will be benefited. 3) One additional LPG refill cylinder will be provided, free of cost, to the beneficiaries of Himachal Grihani Suvidha Yojna and Ujjwala Yojna. Two lakh families will be benefited as a result in the next year. For new Ujjwala beneficiaries, State Govt. will bear the cost of a cylinder, gas stove and gas pipe. 4) Daily wage increased by Rs.750 per month, part time wages also will be raised. Honorarium of different categories as Anganwari workers, Helpers, Mini Anganwari workers, Asha workers, Water Guards, Water Carriers in schools, Mid-Day Meal workers and Helpers, Pump Fitters, Para fitters, Panchayat Chowkidars, Revenue Chowkidars and SPOs increased. 6) “Yuva Navjeevan Board” will be setup under the Chief Minister to tackle trafficking and consumption of narcotics and rehabilitate addicted persons. The Board will comprise all important Government departments, public representatives and experts in the field of de-addiction and Rehabilitation. Five de-addiction and rehabilitation centres will also be established. 7) Sahara scheme started, under which financial assistance of Rs.2,000 per month to be given to patients suffering from grievous and debilitating conditions as such as Parkinson’s, Cancer, Paralysis, Muscular Dystrophy, Haemophilia, Thalassemia, Renal failure etc. 8) Diet allowance of people infected with HIV(AIDS) will be increased to Rs.1,500 per month. Assistance under “Janani Suraksha Yojna” increased to Rs.1,100. 9) Mobile Diagnostic Vans will be introduced to diagnose and prevent breast and cervical cancer. 10) Widows less than 45 years will be provided reservation for admission into Nursing Institutions and ITI’s and will be assisted in upgrading their skills and getting employment. Widows/Deserted women to be provided increased child care support of Rs. 6,000 per child. 11) After Care Homes will be established for orphans residing in Government Bal Ashrams after completing the age of 18 years. They will be provided training under Flexi ITI scheme. 12) MNREGA workers, who work for more than 50 days and widows getting social security pension will now get HIMCARE Scheme health benefits without any premium. Persons working on outsourcing basis will also get benefits of this scheme after paying a nominal premium. 13) The Annual plan of Rs 7100 crore focuses on increasing farm productivity, developing rural infrastructure, developing new sources of Irrigation , Flood Control and social services. 14) State Government will immediately take steps to implement the newly announced Central Government PM Kisan Yojna. Over 8.5 lakh families expected to get the benefit under the Central scheme. 15) Several Schemes and programmes for farmers announced. These include Rs 150 crore Mukhya Mantri Nutan Polyhouse Yojna, higher budget outlay for Anti Hailnet, irrigation and flood control schemes, Mukhya Mantri Khumb Vikas Yojna, Subsidy upto Rs. 25,000 on Indigenous cow breeds, Rs 2 per litre increase in milk procurement price etc. Schemes launched in last budget will also be geared up. 16) The Government has got approval for projects worth Rs.10,300 crore from Government of India for externally aided projects due to its persistent efforts and liberal help of the PM Sh. Modi led Central Government . Most of the projects are aimed at uplifting the rural economy by providing support to agriculture, irrigation, water supply and energy. 17) 50 % Subsidy to be provided under “Mukhya Mantri Swajal Yojna” for up to 50 metre length pipe to provide water connections for poor households. Under “Mukhya Mantri Roshni Yojna” service, no connection charges will be payable by the poor householders applying for new power connection from HPSEB. 18) 500 habitations of the State will be provided with safe drinking water supply. 19) A scheme for “Doubling of Farmers’ Income through Water Conservation and other Activities” will be started with the assistance of Asian Development Bank. Rs. 708 crore recommended for first phase. 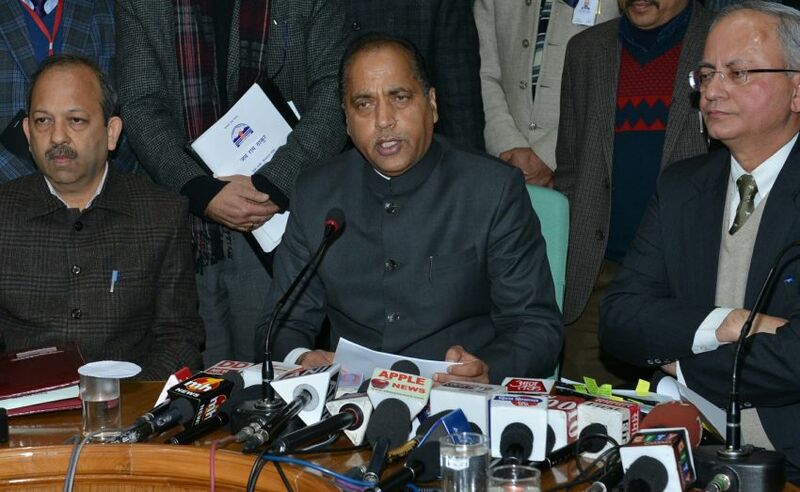 20) “Himachal Pradesh Flood and River Management Project” with the first phase costing Rs.1,235 crore and second phase costing Rs.1,850 crore has been recommended for external assistance. 21) A new Rs 423 crore “Integrated Mushroom Development Project” will be started with external assistance after getting necessary approval from the Government of India. 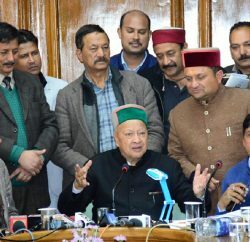 22) “Himachal Pradesh Sub Tropical Horticulture, Irrigation and Value Addition (SHIVA)” project with a total cost of Rs.1,688 will be started with external assistance in Sub Tropical areas to improve farming practices and increase incomes . 23) Breeding farm for Sahiwal and Red Sindhi Cows will be established with a total cost of Rs.11.21 crore and Embryo Transfer Technology will be used for their promotion. 24) Goats will be provided at a subsidy of 85 percent to the farmers living below poverty line. 25) Better quality breeds of sheep will be imported. A farm for Murrah buffaloes will be set-up at a cost of Rs. 11 crore. One Gokul Gram will be set up in the State. 26) Additional capacity of 50,000 litre per day will be installed in Duttnagar and Chakkar Milk Processing Plants. 27) Mukhya Mantri Gram Kaushal Yojna will be started to promote rural crafts and artisanship. 28) A new Mukhya Mantri Green Technology Transfer Scheme will be started. 29) Integrated Cooperative Development Projects will be started in Una and Chamba Districts. 30) Work on Nadaun and Phina Singh Medium Irrigation Schemes will be expedited. 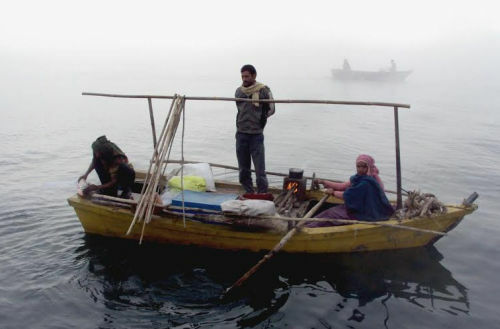 31) The execution of Swan River Flood Management Project and Chhonch Khad Channelization Project will be speeded up. 32) 26,000 old wooden poles will be replaced with steel poles in rural areas to strengthen rural electrification structure. 33) Power tariff for irrigation supply to farmers reduced to 50 Paisa per unit. 34) The Government will bring out a new Micro Small and Medium Industrial Policy. 35) Global Investors Conference to be held in Dharamshala. 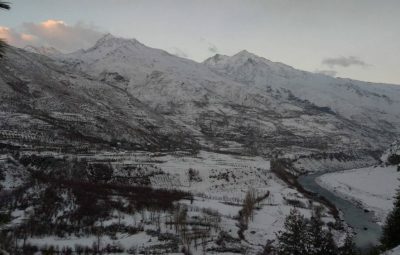 37) A new tourism policy will be brought out and Master Plan for promoting Eco-Tourism will be prepared. To promote Home Stay, the existing room limit will be increased to 4 rooms instead of 3 rooms. 38) Tourism Infrastructure Development Project with a cost of Rs.1,892 crore recommended by the Government of India for assistance from ADB. 39) Heli Taxi services to be launched to connect more towns of the State. 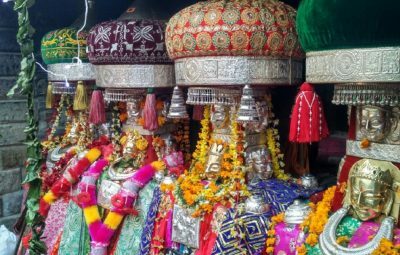 40) “Shiv Dham” will be established in Mandi district to attract tourists. 41) Integrated Public Transport Management System will be started in the HRTC. 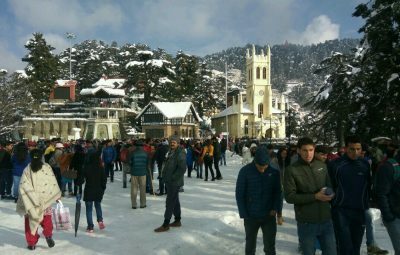 42) The State owned Ropeway Corporation RRTDC will conduct pre-feasibility study to establish “Overhead Mass Rapid Transportation System” in Shimla and Manali Towns. 43) A new electric vehicle policy will be brought out. 44) 750 kilometres new roads, small bridges and culverts on 850 kilometres roads, 1,500 kilometres tarred roads and 50 bridges will be constructed which will connect 50 new villages. 45) Non-conventional material and new technique approved by the Indian Road Congress will be used for construction and maintenance of roads, on a pilot basis. 46) Hydel Projects with an installed capacity of 500 MW will be commissioned. These include the 111 MW Sawra-Kuddu and the 100 MW Uhl Hydel Projects in the State Sector. Execution of Chanju-3 and Deothal Chanju hydel projects to be started. 47) The age limit and investment limit under “Mukhya Mantri Swablamban Yojna” will be increased to provide greater employment and investment opportunities. 49) 40,000 youth to be trained and provided skill training by HP Kaushal Vikas Nigam. 50) Mukhya Mantri Gram Kaushal Yojna will be started to improve skills of rural artisans. 51) Skill Development Programme will be started for Divyang Jans under a new scheme “Navdharana”. 52) 50 ITIs will be upgraded which will enable intake of 5,500 additional students.5 new ITIs to be started in Bhanjraroo, Tissa, Amboya , Sataun and Ladbharol. 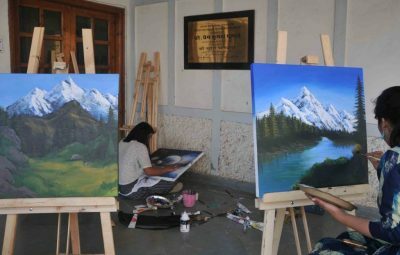 New Polytechnics to be opened in Karsog and Dalash. 53) A new “Khel Kood Pratibha Khoj Karyakram” will be started. 54) MLAs can recommend sports equipment worth Rs.25,000 per registered Yuvak Mandal out of Vidhayak Kshetra Vikas Nidhi Yojna. 55) Two new play grounds with a Gymnasium facility will be constructed in each Vidhan Sabha constituency under the Mukhya Mantri Yuva Nirman Yojana. 56) The financial assistance for SSB coaching increased to Rs.12,000. 57) Nearly 20,000 posts will be filled-up next year in Government. 58) New initiatives announced to improve Quality of Education. These include CV Raman Virtual Classrooms, Vocational Education in more schools, new Vocational trades to be introduced, B. VoC Courses in more colleges, Video Conference facilities, etc. 59) 15 new Atal Aadarsh Vidya Kendras will be started in various Assembly Constituencies. 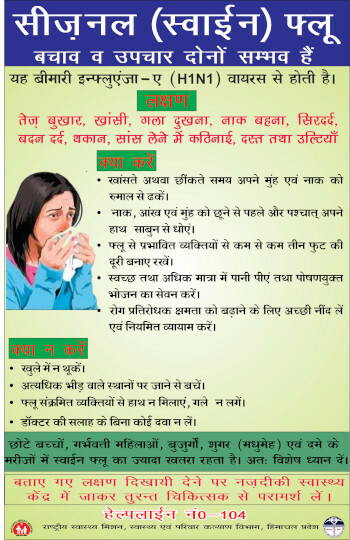 60) A new “Khel Se Swasthya” Yojna will be started. 61) A new “Atal Nirmal Jal Yojna” will be started to provide water purifiers in schools. 63) A new Kalakar Protsahan Yojna” will be started to encourage children from State taking courses in performing arts and encourage their admission in National Institutions. 64) 500 Health Sub Centres and 125 Primary Health Centres will be upgraded to Health and Wellness Centres. 65) 12 Health Institutions will be upgraded under “Sampuran Swasthya Yojna”. 66) Cath Lab will be established in Lal Bahadur Shastri Medical College Mandi and Dr. Y.S. Parma Medical College, Nahan. 67) Digital Subtraction Angiography Machine will be setup in IGMC, Shimla. 69) Mobile Vans will be deployed for diagnosis and treatment of breast and cervical cancer. 70) Sanskrit declared as second Official language of the State. 72) 100 police chowkis of the State to be designated as Reporting Police Chowkis so that FIRs can be registered there. Head Constables will be authorized to inquire into Excise Crime. Senior Police officials will be free to investigate serious crimes. 73) Annual turnover limit for GST registration will be increased to Rs.40 lakh and composition turnover limit will be increased to Rs.1.50 crore. 74) The State Government’s contribution of 10 percent under NPS increased to 14 percent. This will benefit 80,000 NPS employees. 75) DA to employees and DR to pensioners at the rate of 4 percent will be given from 1st July, 2018. 76) Emoluments of contract employees increased. 77) Emoluments of PTA/Para teachers increased. 78) War Memorial will be constructed in Nurpur. 79) One District level Jan Manch in each district will also be held under the Chairmanship of Chief Minister, thus expanding the present scope of the popular Jan Manch programme. 80) MyGov portal will be started to establish direct contact between the Government and public. 81) The provisions of the Public Service Guarantee Act, 2011 will be enforced strictly. 82) State Disaster Response Force will be set up. 83) An annual “Lok Tantra Prahari” grant of Rs.11,000 will be given to the persons arrested under MISA during emergency. 84) Additional 136 G2C Services will be automated and linked with E-district Portal. 85) State of Art Command and Control Centre will be set-up in the State to curb illegal drugs trafficking, forest smuggling etc. 86) State of the Art Driving Test Tracks to be established in Baddi and Jassur. The Chief Minister stated that the finding principle of the Budget is Sabka Saath Sabka Vikas. The Government has established direct dialogue with the general public through Jan Manch and numerous other platforms, The CM further added. 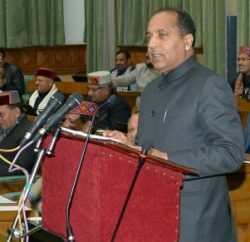 The State has a Vision of achieving sustainable social and economic development and intends to achieve most targets which aim at attaining improved quality of life, elimination of poverty and inequality, better health and more livelihood opportunities under the framework of Sustainable Development Goals, by 2022, Jai Ram Thakur stated.